Jerry in an upright position. As a small group of runners, we ultra-marathon trail runners are a little strange. One of the best known of this small group is Rick Gray. Rick is really in a special group doing 100-milers. I'm certainly not in the same league as Rick but I do enjoy difficult ultras in the 30-to-50-mile range. Also keep in mind Rick is an athlete, an acclaimed high school and college star, where I am at best a middle-of-the pack kind of guy. I could be referred to as a "late-in-life" guy also. 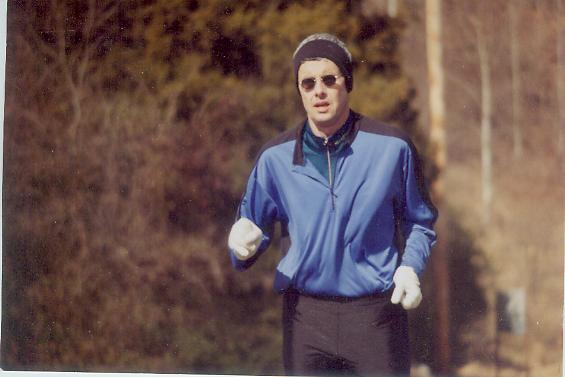 Richard Tyner got me into running when I was 28. At age 42 I entered the marathon phase of my life, completing 24 marathons before realizing that ultras were where I really found myself. Being out in the woods and pushing your body for hours is more my style. However, there are a number of hazards while out in the woods for hours pushing your body to the extreme. My recent experience in the woods using three basic rules of trail running illustrates the importance of using those rules. In preparing for the Iron Mountain 50-Miler scheduled in early September, I decided to train on one of my favorite areas of Greene County Tennessee, the Horse Creek trails. I've been doing this for 10 plus years, so I know the issues of running alone in the woods. Richard Tyner, my training partner, isn't always available so I set out on my own. As usually I gave my wife my route and approximate time of completion. Rule number one. July 30th had a great beginning with a 10:30 a.m. start time. I carried two 22-ounce water bottles, a map of the area, and a Gu to get me through my three-to-four hour run. I had worked my way up three mountains and some pretty technical single track trails. With 30 minutes to the end of my run, I jumped over a downed tree covered with moss and watched my legs fly out from under me. I knew right away that this wasn't good. (I learned much later that I had fractured my leg below my knee, had completely torn my ACL and my meniscus had moved to the front and folded up on itself.) Here I was with about 4 ounces of water on a remote trail three miles from the car. I had thoughts of getting off the trail to find the stream I heard trickling with cool water about 40 yards off the trail, but thick vegetation and the unknown terrain brought me to rule number two: never leave the trail. I remembered the feeling of losing the trail during my first ultra-marathon, the Stump Jump in Chattanooga, and knew that I didn't want to add being lost to my list of concerns. There was a creek crossing in about half a mile and things would be a lot better if I could make it there on this hot (upper 80's) day. I tried to splint my leg to help stabilize it to get to the crossing, but my singlet just didn't do the job. After scooting along for about 100 yards down the trail I realized that I might be doing more harm than good and that I couldn't make it to the car. So, after falling at 2:00 p.m., I knew that my wife would be starting to worry in a couple of hours and would summon help. I got as comfortable as possible and waited. I was, however, concerned about bears since I was in a bear sanctuary area. As a matter of fact, a bear was spotted during my rescue but not near me. As the hours passed, I dug up moss to help retain body heat as the day cooled and the night air would be chilly later on. Additionally, I eyed some tree bark to sit on to get me off the ground some. At about 9:00 p.m. (7 hours after the fall) I heard some welcome voices on the trail. It was Wes and Seth from the Greene County Rescue Squad. They came with water bottles in their hands and smiles on their faces; I was saved! Wes handed me his shirt off his back and field splinted my leg. As we waited for additional rescuers to get to the site, Wes told me about his days in the Boy Scouts. Then up the trail came Daniel Thompson, a teacher at West Greene High School, with food, a jacket and more water. Turns out I had been found but was not out of the woods. My rescuers got on their radios and called off the helicopters and other searchers who had entered my route from different locations. Wes took charge and ordered a plastic stretcher and some manpower to get me out. Carrying a 160 lb. person out half a mile over a rugged trail in the dark is not an easy job, but they did it. Five men carried me to a 6-wheeler and then loaded me on the back. At command central I was met by a host of individuals and loaded into Greene County EMS ambulance at 11:15 p.m.-more than two hours after I had been found. As I reflect back I'm not sure I would change much except the fall. It is not always possible to run with a partner but I did the next best thing, which was to give my route and estimated run time to my wife. I stayed calm because I knew I would be rescued. Rule number three is to stay calm. I stayed on the trail for an easier rescue. As an ultra-marathoner I have had my share of injuries; broken wrist (Holiday Lake 50k), torn rotator cuff (Stump Jump 50k) and was candidate for the blood award several times. This veteran of 32 ultras feels fortunate to still to be able to run ultras at age 61. While this injury will take my longest recovery time yet, I'm looking forward to my next trail run-following the rules of course!